Tracking Santa is not something just fans of Santa do. Santa has people tracking Santa, too. They are called elves. This site is not for everyone. It is for elves who work for Santa as Santa Trackers. (And Santa is what SantaTrackers.net is all about). Why would Santa need elves that track him? Look, Santa has a big job. A very big job. Santa is the first to admit that he has the help of a lot of elves. Most tend to think of elves as toy makers. Indeed, many are toy makers. But Santa also has elves that help him with other things — things like reindeer, his sleigh, wrapping presents and, yes, even flying around the world. We have other websites that tell that story. But this website is run by a staff of elves in the North Pole Tracking Department. Every year the Tracking Department helps Santa plan his flight around the world. And every year the Tracking Department works very hard to make sure Santa has a successful flight. The Tracking Department looks at the weather. It seeks out information from every corner of the world. It tells Santa about obstacles in his path. In fact the only way Santa pulls this off is by having a tracking department with elves everywhere. The Tracking Department is — by far — the biggest department of elves working for Santa Claus. Just before Santa takes off he sends some elves from the North Pole to different areas of the world to track him, look for dangers and to report back to the North Pole. He also has elves — millions of them, in fact — that just report on those things from where they live. 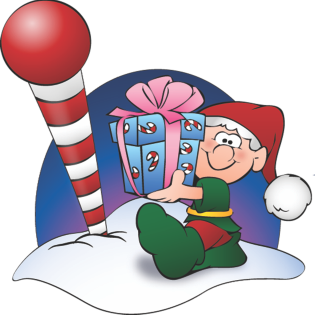 This website is where those elves receive their instructions and send in their reports to the North Pole Flight Command Center. It is a site by elves — for elves. It is a site for those who track Santa for Santa. We get lots of email from people who want to do this — to be an official Santa Tracker. And yes it is possible but first you must apply to become an elf and to live by the Elf Code. Then, and only then, can you apply to become an official Santa Tracker.